Director Miguel Arteta charmed the pants off an already fawning crowd following the Sundance screening of “Cedar Rapids,” his new comedy starring Ed Helms as a hopeless poindexter who gets caught in the bright lights of the big city. “Thank you, Buenos Dias,” said Arteta as he took the podium at the Eccles Theater. “Thank you for coming out this early, and I'd love to hear any thoughts, questions…"
"Awesome!" came a shout from the balcony. Watching the film, it’s easy to be reminded of Helms’ work in “The Hangover,” another film that found him swallowed whole by a city teeming with temptation. But Helms was a part of developing this project before “The Hangover" even opened. “It all started with Phil Johnston the writer, he's a first-time writer he had this idea. 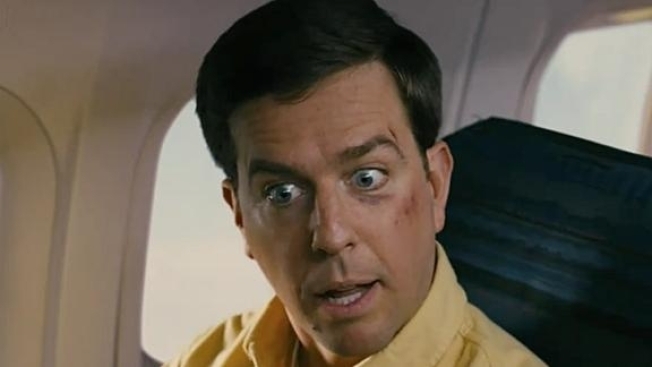 He actually contact Ed Helms even before 'The Hangover,' he had Ed Helms in mind. And he contacted him before he wrote and said, ‘I have this idea about this guy who's terrified to go to the big city of Cedar Rapids. Ed loved it, he said, ‘Let's develop it together, I’m in.’ So there was a lot of love in the development of it, they came up with the script together and then they contacted the King of Midwest Films, Mr. Alexander Payne, and he loved it, and his wonderful producing team got involved. And then they said, OK, who can bring our Midwestern vision to life?" and they said, ‘A Puerto Rican.’"
But what’s up with Helms and hookers? Whitlock’s character, Ronald Wilkes, is a huge fan of “The Wire,” something that was already in the script before Whitlock got involved. “What's amazing is the ‘Wire’ lines preceded him being in the cast. Phil wrote those ‘Wire’ lines and then we had the absurdity of watching a guy from "The Wire" audition, and we were like, "I guess we're going to have to change that, it's gonna be too meta and then we were like, "Aw, screw it, it's great, let's just have it." At one point a self-identified “Cedar Rapidian” asked how it was that her hometown became the setting for the film. A flurry of questions followed about the setting, the location and other matters of geography, forcing Arteta to finally surrender any depth of knowledge on the subject. “I'm from Puerto Rico, and it was all the Midwest to me,” the director shrugged. Arteta is another Sundance veteran, whose relationship with the festival has progressed from unknown hoping to make to an established talent returning to premiere a studio film. “What was your first film?” came a shout. “For this? Cedar Rapids 2: Bugaloo? It's coming up, it's gonna be all about the future of Top Notch Insurance. There’s a very brief scene, maybe four seconds, in the film with a Jack Nicholson impersonator doing a lounge act, but some poor soul in the audience mistook him for the genuine article and asked Arteta how on Earth he got Jack to take such a small role. You could argue that his answer was either very kind or very cruel. Either way, it was a pretty amusing bit of deadpan. "Well, you know, Alexander work with Jack on About Schmidt, so we were able to pull him in and come and do that loge act for us." “Do you do stand-up, too?” came one last shout.